It’s the second day of our exciting study tour to Aarhus, Denmark and the weather is extremely sunny and warm. Our first stop is the global packaging company Amcor. Amcor was founded in the 1860s in Australia and has developed to over 200 manufacturing sites in the world nowadays. One of the most important principles of Amcor is ‘Global scale, local mind set’, which means the company attaches great importance to the demands of every market. As the biggest packaging company in the northern Europe, Amcor has countless partnerships with different industries. 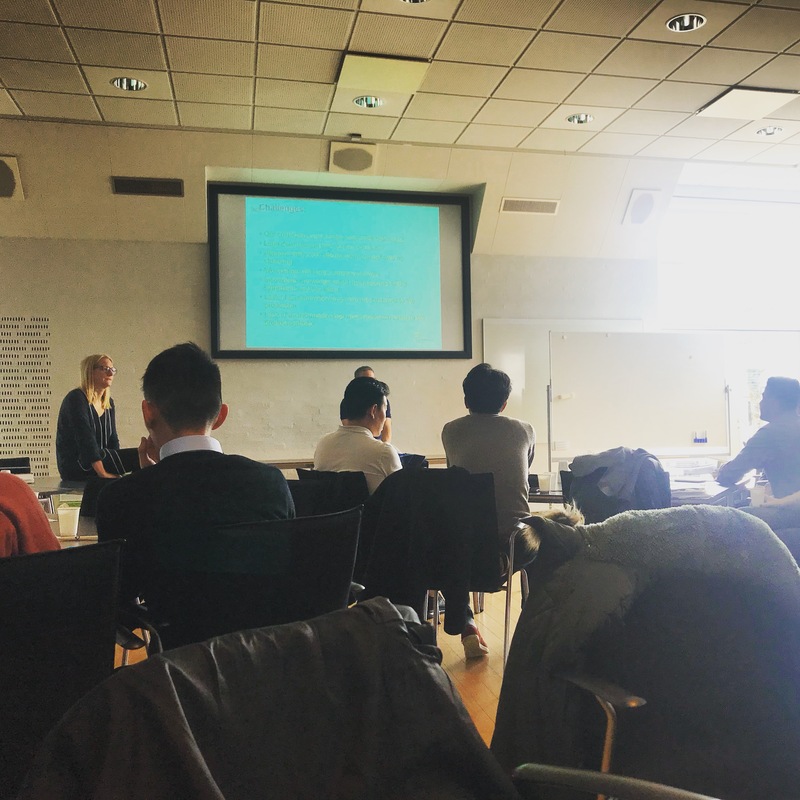 As Lars Bottezeu and Kyra Chavales gave us a brief introduction of the company’s history and business scale, our learning of the day had begun. 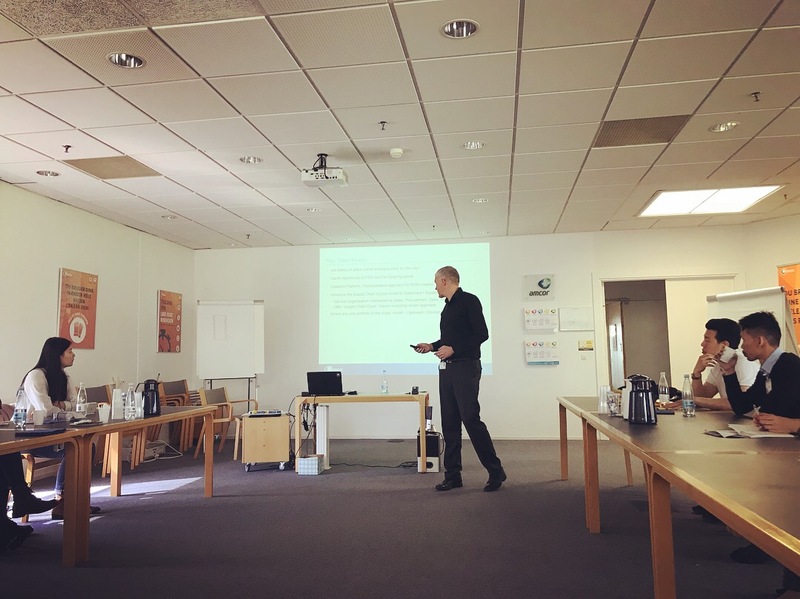 In the middle of the presentation, Lars taught us what exactly we need packaging for: safety, quality, values, certain information. The materials and processes that different packages need can be completely different. Usually, the finished goods are made of different layers of multiple kinds of plastics, which makes the processes for different packaging products more complicated. For example, for products with long lifecycles, such as the medical products, the packaging process and requirement are standardized and remain unchanged. But for product like chips, the promotion need of this kind of fast-consuming good requires the packaging to change constantly. In this case, the made-to-order good would really test Amcor’s ability to ensure the customer lead time. According to Lars, when they get the order, the lead time can be from a few days to 12 weeks because of the complexity of the production processes. After the introduction, we were invited to the warehouse (production site) tour. Due to some safety issues, we were not allowed to take any pictures of the site. But what worth mentioning is that the whole production site and the warehouse are both very organized and there is seldom any waste. In the warehouse, most of the products stocked there are different kinds of huge plastic rolls. Amcor made special bases for the rolls to be fixed on the shelf so that the forklifts can easily pick them without making any damage. When we were in the production site, Lars told us that Amcor has recently purchased several new machines but the old machines are still being used, so there was a problem of the inconsistency in production efficiency. 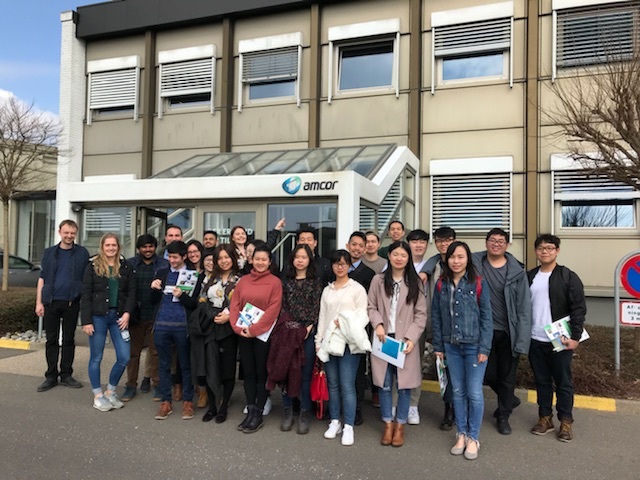 In addition, Amcor’s suppliers are currently located in Germany so in order to improve the transport efficiency, Amcor has just been started to use 4PL in its transport and delivery of the product. 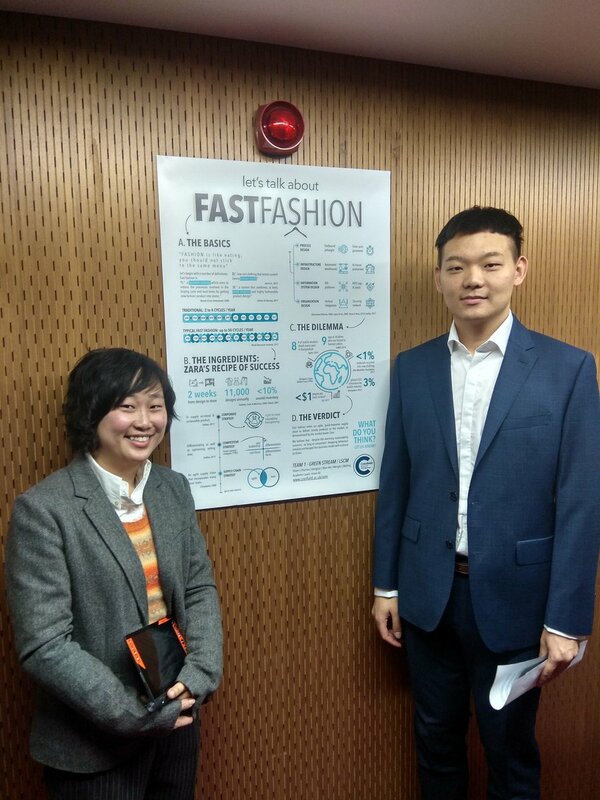 After the tour, our team further discussed some issues regarding the impacts on the environment and sustainability. Amcor has been trying to make all packaging product fully-recyclable through recent years and will surely achieve in the near future. In the afternoon, our team headed to the Lantmännen Unibake, the biggest bakery production company in Demark. According to the Denmark, there are new products being developed so the company was facing problems of acknowledging consumers’ real demand and balancing between product range and cost. What’s more, due to the different making process and the cleaning time of different product, the changeover time can usually be two hours long. The company discussed these problems with our team and encouraged us to come up with possible solutions. One of the most feasible solutions our team came up with is that the company should share data with the retailers to get a hold of the consumers’ real demand. After the discussion, we were invited to a tour to the production site. But due to safety reason, we were not allowed to take pictures either. During the tour, we witnessed the complete process of the production: Dough-laminating-making up-rising-freezing-packaging. We also learned that the bakery’s production lead time is relatively long, so one important problem regarding the situation is the new product’s lead time. Finished with our learning of the day, we couldn’t help but gather around the city centre again! 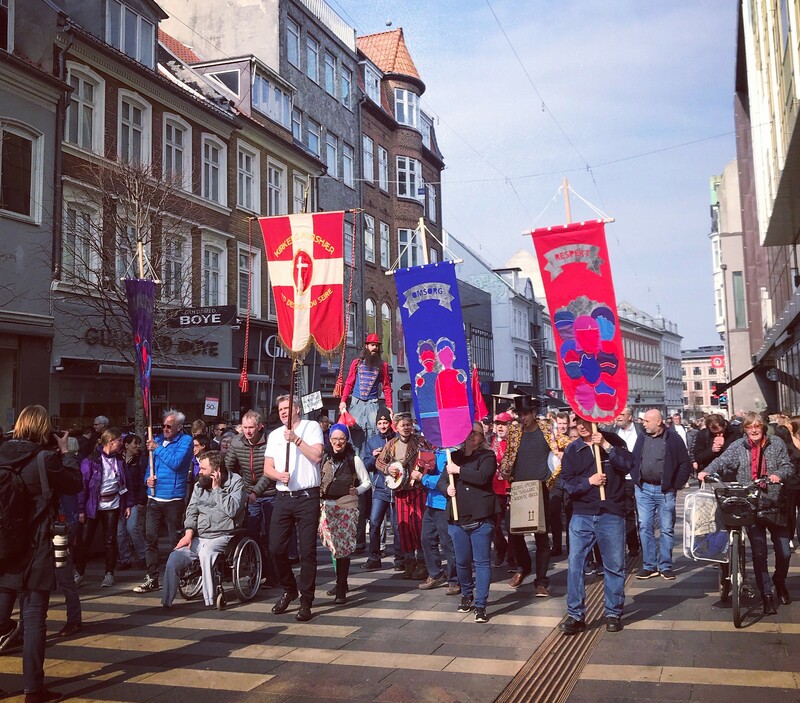 It turns out that there was a charity march for the homeless people in Aarhus. The crowd was singing, dancing, talking to each other with smile on the face. Perhaps kindness of the people is the thing that Denmark is most proud of. Over and out, this is the second day of #TeamDenmark!